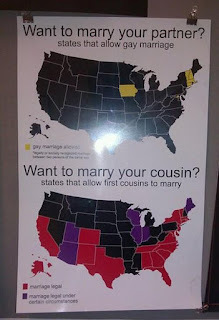 I don't judge people in Texas that marry their first cousin (it's legal), but why can't I marry the person I love too (it's not legal)? You are so precious, so valuable to so many. The world is a better place "where ever you are!" Hopefully gay marriage will be a reality sooner than later. As it is now, just remember that it is a reality now to those who love you. I know that's not the issue - but maybe that reality will keep spreading and will solve the issue in your favor. Love you soooooo much.